"You don't turn your back on family." 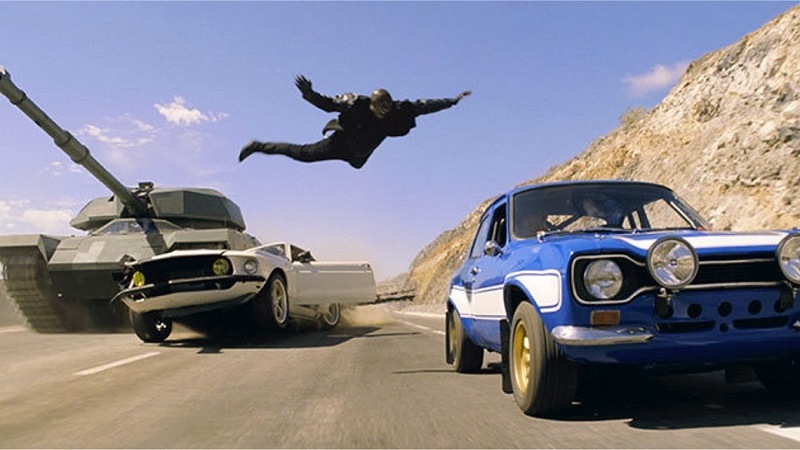 I am firmly on record as a big fan of the Fast & Furious franchise, but it wasn't always that way. 2 Fast 2 Furious is a flat out terrible film, and while I really enjoyed Tokyo Drift, its utter lack of original cast members (not including a cameo by Vin Diesel in the closing seconds) seemed to indicate that this was a franchise destined for the direct-to-DVD rack. But three years later Universal was able to bring both Diesel and Paul Walker back into the fold and suddenly we were off to the races once more. And even more surprisingly, each movie was astoundingly better than the last. Furious 6 hit theaters in May and I'm not ashamed to admit that it emerged as one of my favorite movies from a crowded and fairly disappointing summer. Moreover, the promise that the franchise was finally going to swing back and close the bizarrely awesome time loop in its own chronology while also adding a couple of big names to the roster propelled my excitement through the roof. The Saturday night after Thanksgiving, Jamie and I were out at a bar watching USC choke against longstanding rival UCLA. When halftime rolled around, I took out my phone to see what else was going on in the world and discovered an avalanche of tweets indicating that Paul Walker had just died and in a car accident of all things. I was surprised at how immediately affecting I found his sudden and abrupt passing. Walker is hardly my favorite actor of all time and he was involved in some pretty crap films over the years, but he was also in Pleasantville and the criminally underappreciated Running Scared, so I couldn't help but be fond of the guy. The fact that he was still in the midst of filming Fast & Furious 7 when he died only added an extra level of tragedy to an already somber affair. Bart and I had been itching to lay down another podcast, and with Walker's death fresh in our minds and the recent video release of Furious 6 (with some proceeds going to Walker's Reach Out Worldwide charity), this felt like the right moment to finally get around to covering the film while also speculating on the potential cinematic and automotive fallout from Walker's death as well as contemplating the future for what has become one of our favorite active franchises. We also dive into the Fast & Furious-adjacent news of Gal Gadot being cast as Wonder Woman and what's going on with the larger DC universe, as well as my particularly awkward screening of Blue Is The Warmest Color. Plus you can hear my dog barking in the background! This is our longest episode yet, but it's also starting to hone in on something closer to where I'd like these podcasts to end up. At the very least I think we've definitely found our theme song, courtesy of The Visitor, but I'm still experimenting with some formatting stuff, so I'm open to suggestions.